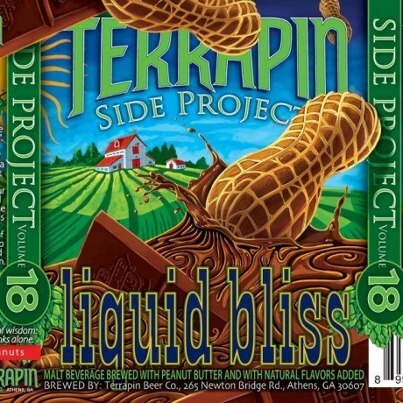 Following an intense line of crisp, spicy brews in its Side Project series, Terrapin’s latest seasonal one-off, Liquid Bliss, does not share the complexity of its predecessors. But in the case of a chocolate and peanut butter porter, Liquid Bliss’ flavor profile, complexity could’ve brewed up a sugary fluid more like a milkshake than a beer. Three cheers for restraint. Two separate infusions of peanuts, an early injection of peanut butter and a later cooking with boiled peanuts, give Liquid Bliss a powerful nutty smell without a corresponding overpowering taste. Whether poured from the bottle or a tap, the scent of warm peanut butter and malt is unmistakable. But once you drink it, only a hint of boiled earthiness remains. Plug up your nose and Liquid Bliss is a sturdy chocolate porter: not too hard on the mouth, easy to drink, not overly sweet. Terrapin’s Side Project series—boasting recent wild titles like Samurai Krunkles and Phlux Capacitor—is an exercise in creativity. Samurai Krunkles, for example, is a bright, hoppy beer with overt references to green tea, a real firecracker in the mouth. Liquid Bliss, comparatively, is much more subtle. Though its label depicts a Georgia peanut riding a wave of melted Olive and Sinclair cocoa nibs, the beer tastes like only a sensible dip in such a chocolate ocean, not a wild ride on it surf. Liquid Bliss is not a beer for Reese’s Peanut Butter Cup lovers. Such sweet teeth will certainly feel disappointed. As will porter fanatics hoping for a reinvention of the style. The rest of us have a solid, flavorful beer that doesn’t overwhelm or offend.